Result showed Barisan Nasional (BN) coalition won 72 out of 82 seats. This is a landslide victory for BN coalition in Sarawak. In comparison to the 2011 Sarawak election, BN won 55 out of 71 seats, Democratic Action Party (DAP) won 12 seats, Parti Keadilan Rakyat (PKR) three and one seat was won by an independent candidate. Although the total voter’s turnout was lower than expected, the online and on-ground campaigns have clearly impacted the way how voters react during the polling day. The state of Sarawak has a small percentage of internet users. The Malaysian Communications and Multimedia Commission (MCMC) in its Q2 2015 report, stated that Sarawak has a total of 78.3% broadband penetration rate per 100 household. According to the Internet User Survey 2014 by MCMC, internet users are mainly concentrated in the states of Selangor, Johor and Kuala Lumpur; with Sarawak only having 6.4% of the pie. Despite the small percentage of internet users in Sarawak, we recorded 94,471 conversations across Twitter, Facebook, mainstream news media, news aggregators and other online media platforms on the Sarawak Election fever from April 4th until polling day on the 7th May 2016. These conversations have a collective impact to more than 2 million social media users who are following political leaders and organisations in the digital media sphere. 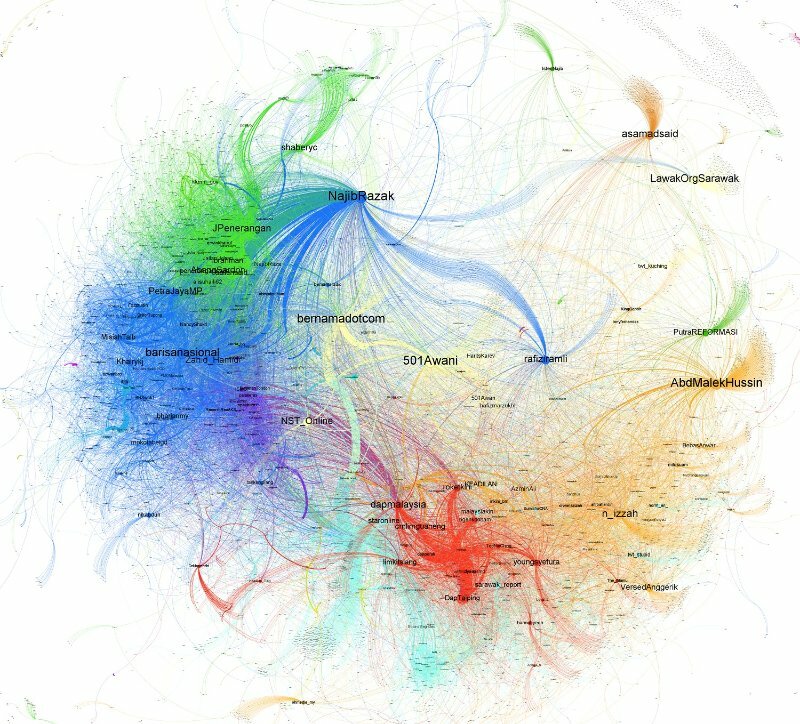 A Social Network Analysis (SNA) was performed on 94,471 conversations to examine the key influencers and the connections between each netizens. The SNA chart below were constructed through multiple posts or mentions, shares and retweets. Each node represent a unique netizen (i.e. individual social media user). SNA results show that BN continued to dominate conversations via various campaign hashtags such as #TeamAdenan and #TheAdenanWay. Meanwhile, DAP’s online campaign #BeraniUbah and related conversations came second, eclipsing PKR’s #DemiSarawak. Parti Islam Se-Malaysia (PAS)’s online campaign #UntukmuSarawak started out strong but did not sustain itself. Over time, it appeared to compete with Parti Amanah Nasional (Amanah)’s #UntukmuSarawak. During nomination day, Amanah and PAS saw an increase in conversations, but they lagged behind the massive influx enjoyed by DAP and PKR. On the BN side, Prime Minister (@NajibRazak) continued to be a major influence to netizens. We observe that other ministers and candidates also amplified the Prime Minister’s posts, including Deputy Prime Minister (@ZahidHamidi), Dato’ Sri Shabery Cheek (@shaberyc), Barisan Nasional (@barisanasional), Dato’ Sri Fadillah Yusof (@PetraJayaMP), Nancy Shukri (@Nancyshukri), and @BNforTupong. Generally, BN’s online campaigning and related conversations were well orchestrated and carried the same factual messages. Similarly, DAP’s online campaign, interactions, and mentions appeared to be consistent among DAP Malaysia (@DAPMalaysia), Lim Guan Eng (@cmlimguaneng), Lim Kit Siang (@limkitsiang), Rocket Kini (@rocketkini), Syefura Osman (@youngsyefura), A. Samad Said (@asamadsaid), and Malek Hussin (@AbdMalekHussin). It suggests that these politicians were sharing their respective messages coherently to supporters and followers. PKR had its fair share of influencers such as Pantai MP Nurul Izzah (@n_izzah), MummiMeow (@VersedAnggerik), Putera Reformasi (@PuteraREFORMASI), KEADILAN (@KEADILAN), Rafizi Ramli (@rafiziramli), and Selangor Chief Minister Dato’ Seri Azmin Ali (@AzminAli). The influence of mainstream news in Malaysia to voters or the public at large cannot be ignored. Our analysis revealed that mainstream media with a strong online presence such as Bernama (@bernamadotcom), New Straits Times (@NST_Online), and AstroAwani (@501Awani) have strong interactions with netizens who are spread across the political divide. The existence of alternative news portals and blogs provide equally strong influence on the Sarawak election conversations. News portals such as MalaysiaKini (@malaysiakini & @mkini_bm) and Sarawak Report (@sarawak_report) are popular among pro-Pakatan netizens. Does Social Media Impact Voters in Sarawak? The short answer to that is yes. The long answer is that the impact to voters is indirect, as not all netizens in this analysis are registered voters, nor are they voters in Sarawak. The effect of traditional media and mainstream news dominating the digital sphere also bring a compounding effect to the netizens and voters. While national issues were being pushed, the election conversations revolved around predominantly local affairs. Bread and butter issues such as toll abolishment, the cost of living, standardisation of ferry rates, infrastructure, native customary land and autonomy can exert a slow-yet-deadly influence to the older generation of Sarawakians in the long term. As the number of social media users in Malaysia are growing steadily each year, the effect from social media conversations (and campaigns) to registered voters will be more apparent in the next Sarawak Election.